For those who are lovers of The Yule Log and of Christmas music in general, this man needs no musical introduction. However, for those who may not be familiar with Percy Faith -- especially younger folks, then this one song would be a perfect introduction -- and it would say more musically than I could ever say verbally in mere mortal words. The song is Mr. Faith's rendition of "O Come All Ye Faithful," which was originally released in 1954 on his classic and legendary Columbia Records LP, Music Of Christmas. The version that you're about to listen to is the one that was released on the re-recorded Stereo LP in 1959. One of the many aspects of Mr. Faith's immense and incredible talent were his brilliant arrangements. In particular, his gift for being so deftly able to create beautiful counter-melodies that would complement the original melody of a song. For this song in particular, the first counter-melody begins 14 seconds into the song: the brass section plays the main melody and the string section plays the counter-melody. Then, at 3:11 into the song, comes the next significant melody/counter-melody duet between the brass and the strings. This song, like every song from Music Of Christmas and his second Christmas album, Hallelujah (originally released in 1958 and renamed Music Of Christmas, Vol. 2 in 1965), sounds like it was piped down from heaven. His music projected simultaneously a power, majesty and reverence like nobody who came before him, or anybody who has come after him. He had the unique ability to emit with his music heart-wrenchingly poignant emotion and feeling. I am not at all ashamed to admit that I cannot listen to his music without an occasional tear welling up in my eye. Click Here~ "O Come All Ye Faithful"
Not only were Faith's own Christmas albums terrific, but he was responsible for the arrangements on one of the greatest *vocal* Christmas LPs ever: Johnny Mathis' Merry Christmas, from 1958. This was one of the greatest collaborations ever, and certainly one of the greatest Christmas albums ever. Mr. Faith not only did the arrangements, but he backed up Johnny's beautiful vocals with his great orchestra as well -- a great, great album and without a doubt in the Top 10 of my "Top Play." It was the single greatest oversight of the Yule Log that music from this LP was never used on the soundtrack. Percy Faith, who is the undisputed King of the Yule Log by virtue of his 10 songs that appear on the original classic 3-hour presentation, always led the way at the beginning, and closed the program at the end with his rendition of "Joy To The World." *He is the only artist who has songs represented from 3 different albums. *He is the only artist to have a song reprised in the show ("Joy To The World" -- always the first and last song). *He is the only artist who has music represented in all 6 of the 30-minute tracks that made up the original 3-hour broadcast: In 4 of the tracks he had 2 songs, and in 2 of the tracks he had 1 song. In my entire collection, there are only two albums that I do not have the audacity to rate on my scale of 1-10, as they are beyond my ability to apply such an arbitrary number due to the sheer perfection that was achieved in their majesty and reverence of arranging, conducting and performance. They are: "Music of Christmas," originally released in 1954 in mono, then re-recorded and re-released in 1959 in stereo; and "Hallelujah," originally released in 1958, then later reissued in 1965 as "Music of Christmas Vol. 2." To rate these two albums in my opinion, would be like putting a price on the Mona Lisa -- which of course, is priceless. Mr. Faith's third Christmas album was "Christmas Is" from 1966, and I rate this album at 8 on my scale of 1-10. Does anyone know who has a similar version of Gesu Bambino (instrumental) to Percy's ?? Hi Maxine, and welcome back to the board! As I indicated above, Percy Faith never recorded "I'm In The Mood For Love." You were probably thinking of Jackie Gleason's version. By the way, I totally agree with you on "Angels We Have Heard On High" and "Gesu Bambino." They are 2 of my all-time favorites of Mr. Faith as well. Also, "Theme From A Summer Place" was first released as a single in 1960. It became the top-selling single for all of 1960 and stayed at #1 on the Billboard charts for an incredible 9 weeks -- the longest all-time run of any instrumental song in the history of the Billboard charts, a record that still stands to this day. The song that year also won the Grammy Award for Record of the Year. It is yet another lasting legacy of this man's greatness. Chip, thanks so much ! You know, I wondered where all those songs came from. I have a confession: I wasn't completely sure they were Percy Faith, but , you know, he's got such a distinctive sound, with the strings and all.....I always think everytime I hear an instrumental in that style....it must be Percy Faith !!! The song starts at about 1:45 . It sounds very Percy Faith, but I don't know. Do you know the title and who it's by? Maybe it's Mantovani? I'd been thinking about that wonderful song since 1981.....but never knew what it was or who it was by. This beautiful song is "My Cup Runneth Over," and it was performed by the incomparable Mantovani, who is the second greatest easy-listening artist ever -- second only to the great maestro, Percy Faith. Monty (as he was affectionately known by his friends and fans) recorded the song in 1968; it was released on the London Records LP, "The Mantovani Touch" (catalog #PS526). The song was originally a Top 10 hit for Ed Ames in 1967; it made it to #8 on the Billboard charts that year. And for good measure, here is a great Christmas song Ed Ames did later that year on his 1967 LP, "Christmas With Ed Ames." My Cup Runneth Over ! I might have guessed Mantovani.....but had no idea what the title was. Mantovani and Percy Faith are nearly interchangeable. Chip you've been a great help. I can't tell you how long I'd been looking, just for the title of that song. You know, I think I like Ray Coniff's version of 'Cup' a bit better. But it seems Ed Ames had the greatest success with that song. Say, did Ed Ames do a version of "I Heard The Bells on Christmas Day" ???? Although, I like Frank's version of that the best. Anyway, because, you been so helpful, Chip.....here's my playlist from Last FM---I don't know if it works, or if you have to register.....but anyway....it's just a mish-mash of songs I've collected, a lot of Christmas, but non-Christmas too. Percy Faith -vs- Billy Vaughn -vs- Mantovani !!!! Hey, what about Felix Slatkin and Raymond Lefevre ? YouTube has a little bit of Raymond Lefevre, but nothing Christmas. Felix Slatkin has a version of Deck the Halls, that's I'd love to get my hands on, although it's nothing like Percy Faith's Deck the Halls....which is legendary. Slatkin's compositions seem extremely uptempo and chirpy---at least the ones I've heard. Yes, Ed Ames did indeed record a version of "I Heard The Bells On Christmas Day." It was released on his first Christmas album in 1967, "Christmas With Ed Ames." As for Felix Slatkin, EMI was set to release his Christmas album on CD in 2006, but then dropped the idea because of a downturn in overall music sales. The Raymond Lefevre and Felix Slatkin albums, along with both of Billy Vaughn's Christmas albums, are in the 2nd Tier of my "Top Play" (albums 126-250 in my collection). And yes, Ray Conniff had a terrific version of "My Cup Runneth Over" as well. As for his Christmas music (which was absolutely spectacular), all three of his Christmas albums are in the 1st Tier of my "Top Play" (albums 1-125 in my collection) In fact, his first two are in my Top 10, and his third is located within my Top 25. He is one of the Christmas music legends. Sadly, Mr. Conniff passed away just a few years ago at age 85. My favorite rendition of my favorite carol. I didn't see that one on YouTube; otherwise I would have posted it in my first message of October 12th when I addressed this LP. Good find Mike and thanks for posting it! Just to let folks know out there: the second song included on the YouTube post (The Little Drummer Boy) was not from the 1958 LP; it was from Johnny's 1969 LP, "Give Me Your Love For Christmas," which cannot hold a candle to the 1958 album. He was just a more disciplined singer when he was younger, plus he had the arrangements and backing of Percy Faith. Indeed, that's not even Johnny's best recording of that song! I much prefer the version he did with Don Costa on his 1963 Mercury LP, Sounds of Christmas (an album that unfortunately has never been reissued on CD its entirety). That's exactly right Mike, but I have a theory as to why the original version of "The Little Drummer Boy" was not used by Columbia when they reissued the Mercury LP on their label. By the way, aside from 1958's "Merry Christmas" LP, this 1963 Mercury album is the only other Johnny Mathis Christmas album that is in my "Top Play." However, unlike "Merry Christmas," it is not in my 1st Tier; it resides in my 2nd Tier (albums 126-250 in my collection). Musically speaking, one of the greatest disappointments is that all subsequent Johnny Mathis Christmas albums just paled in comparison to that first great original album he did in 1958. His voice in the 1950s (when he had his greatest commercial success) was so much more poised and disciplined, and it showed in his music. Anyway, in 1971, when it was reissued, it included 2 less songs: "The Little Drummer Boy," and a delightful original song, "Have Reindeer Will Travel." The former was the last song on side 1, and the latter was the first song on side 2. Therefore, that meant that these 2 songs were consecutive songs on the Mercury master. It is my theory that the master must have gotten damaged. So when Columbia Records reissued the LP on their Harmony label in 1971 as "Christmas With Johnny Mathis," they had no choice but to delete these 2 songs from the album. There could be no other explanation as to why Columbia would not have used these 2 great songs, none. But, even if the master were damaged, surely the original session multi-track recordings would have still been around for Columbia to do a remix from, right? I mean, the album was less than a decade old at that point, Johnny was a top-selling vocal star, and Mercury was no fly-by-night operation. As you point out, when Columbia first reissued the album it was on their budget Harmony Records imprint. So my theory is that omitting two tracks was a way of keeping the "price point" down for consumers. When Columbia later reissued the album on CD in the '80s, they just grabbed the second-generation LP master from their reissue rather than going back to the original Mercury master, or the session tapes. Of course, this begs the question of why Columbia/Sony/Legacy or whoever has never seen fit to remaster the album since that first CD came out. Again, I can't believe that the multi-tracks aren't still extant even if the original LP master isn't. First: Not all of the Harmony reissues were abridged LPs. Although, I completely understand that you are too young to have known that, since most of these Harmony reissues were released before you were born. Second: Given the magnitude of the kind of star Johnny Mathis was at that time, do you really believe Columbia Records would have been that stupid not to take full advantage of offering this album in its entirety if they could have when they first reissued it in 1971? Third: For what other possible reason would Columbia have had when they had Johnny re-record "The Little Drummer Boy" in 1969 if it weren't for the reason that the original master had been damaged -- much in the same way that Bing Crosby had to re-record "White Christmas" in 1947 because the original master had become damaged. And the age of the master has nothing to do with it. In fact, the "White Christmas" master was only 5 years old when Decca Records had to replace it. I used to think at one time that perhaps the reason Columbia didn't use "The Little Drummer Boy" track on the reissue was because they didn't get the rights to the Mercury LP until 1971, and since Johnny had recorded a version for their own label in 1969, they didn't need it. But that can't be the case because simply speaking, there is no big deal with having the same song on two different albums -- especially if they are two different versions as they are here. Fourth: Why would Columbia voluntarily leave off the reissue LP (and today the CD) one of the two original songs that were written exclusively for this album by Jerry Livingston and Paul Francis Webster -- that song being, "Have Reindeer Will Travel." I used to think that it might possibly be because Columbia didn't want to pay the royalties to use the song, but since they use the other original song by Jerry Livingston and Paul Francis Webster, "The Sounds of Christmas," I really don't think that is the case. "As yet we cannot say which of the JD Christmas albums we will use. It depends on whether RCA can locate the original masters and what condition they are in for re-mastering. It took 6 months for them to find the tracks for “Where Did the Night Go”!!!! Naturally we are hoping that “The Spirit of Christmas” will be acceptable as well as the Living Voices album. We will of course notify you when we have a release date later next year." And let me stress the point that this was for one album that was recorded in 1963 (the same year as the Mathis LP) and the other for an album recorded in 1974 (11 years after the Mathis LP). So you see, you really don't know. Of course, I have a much different perspective on this from most people because I have family in the recording industry. My cousin Frank DeCaro was a member of the Baja Marimba Band back in the late '60s and early '70s, and then later became a record producer/arranger. And my late cousin Nick DeCaro was also a Singer/Musician who later became a record producer/arranger. Between them, they have produced, arranged and performed on albums for Neil Diamond, Barbra Streisand, Glenn Frey, Dolly Parton, B.J. Thomas, Martin Denny, among many others. Yes, it sure was. And from what I understand, the sound they achieved was incredibly close to the original. I've been looking for an instrumental version of 'Make It Easy On Yourself'......the one that has the piano running through it. I'm wondering if it's Percy Faith's version, off the album 'Themes for the in-crowd' ...that I'm thinking of. There's only two copies left of that on Amazon, and I'd be disappointed if I bought the album and it wasn't the version I remembered. Chip, do you know if Percy Faith's instrumental 'Make It Easy On Yourself' was the one that had a bit of piano in it ? No Maxine, there is no piano on Percy Faith's version of "Make It Easy On Yourself." For those who want the two "missing" Johnny Mathis tracks, Ernie(not Bert) has them on his blog. I just got them a couple days ago. Just search the blog for Johnny Mathis. While we're in a Percy Faith mode, I have to say that my favorite track is his "The First Noel" from "Music of Christmas". If I could only have one version of that song, that's the ONE. Right on, brother; it's yet another great selection from his masterpiece. What I should love to see is a CD containing both versions of "Music for Christmas". They would both fit, I'm all but certain (the timing for the stereo version being some 39 minutes long), and would make a glorious 2-for-1, original artwork , original notes + new notes, the whole bit. That is something we've discussed many times here on the board before. My advice for everyone out there is to contact Sony Music expressing your desire to see this happen. The recent success of the write-in campaign for the Hollyridge Strings CD proves that your voices can make a difference. In the mean time, for those who don't already have it, there is another copy of "Music of Christmas, Vol. 2" currently up for auction on eBay. This one is not used and is still sealed. If you bid, hopefully you can get it for a reasonable price. Good luck! By the way, Columbia Records in the past had already released these two masterpiece albums together; they did it twice in the 1960s. What they did, curiously, is that they released this 2-record set with the original 1954 mono version of "Music of Christmas," not the re-recorded 1959 stereo version. That is very odd, indeed. Incidentally, was the 1959 recording itself ever released in a mono mix? Yes Mike, and that's what's so strange. In 1959, after Mr. Faith re-recorded "Music of Christmas" in stereo, Columbia released a mono version of the stereo recording. The catalog number for the Mono LP was CL-1381; and the Stereo LP was CS-8176. That's why it was so strange when they used, not only a mono recording, but the original 1954 mono recording for this 2-record set. It was very, very odd, and none of us who are knowledgeable about Percy Faith's music have ever been able to ascertain why Columbia did this. By the way, for those who are not aware, back in the late 1950s and up to the mid-1960s, many people did not yet own stereophonic equipment, so it was customary of the record companies to offer LPs in both mono and stereo. I think the most likely thing that happened was the master tapes probably got lost. Quite often things will be reissued with inferior sound due to use of backup or safety copies that don't sound as good as the original master. Also, multi-track tapes very often get lost. With digital surround sound technologies (dts audio CD, SACD, DVD-A), many older albums got remixed in 5.1 surround sound. Many that would've been great albums to be remixed did not. In some cases, albums were announced or scheduled for 5.1 surround remix, and didn't happen, because they couldn't find the multi-track masters for all songs on the albums. I know this was the case for Steely Dan - Aja, Yes - Close to the Edge, and Todd Rundgren - Something/Anything. I really wish the labels would keep better track of their tapes, these things will only last a certain amount of time before disintegrating, and someday many of these masters will be lost forever. I am a big fan of Vanilla Fudge, and I know nothing about any album being re-recorded due to tape damage. All of their original 60's albums are available on CD as they were originally recorded. I also know nothing of any remixing from the multi-track. The only things I know of that could have gotten confused with this are, their 5th album "Rock and Roll" has 2 different mixes, but they were both released around the same time and no one with the band can explain why there were 2 mixes, in the 90s a live album was put out that Carmine was behind that the rest of the band wouldn't sign off on, so he took the multi-tracks of the live recording, muted Mark, Timmy, and Vince's parts and had other people overdub parts in the studio to his drums and called that a Vanilla Fudge live album, which Mark Stein sued him over and won, and in 2002 a reunited Vanilla Fudge put out an album called "The Return" which consisted mainly of them performing their old material. Thanks for the input. And yes, it is very possible that the master just simply could have gotten lost. It's amazing how this kind of stuff actually happens, but sadly, it does. As for the Vanilla Fudge, all I know is what I remember being told by someone several years ago. But since I am not a particular fan of the group and don't have as much knowledge about them as you, I gladly defer to you on this one; although, he was quite specific on this. Hmmm.....that is really interesting then, that you would've been given that specific information about that. They had a best of come out in '82 which didn't involve and re-recording, a reunion album in '84, and a reunion in '87 which I believe is when the tapes that were used for the overdubbed live album in '91 were originally recorded....I just can't think what they would've been re-recording in '86. But that is the type of things that I've heard of other bands doing. I know the entire Buckner and Garcia Pac-Man Fever album got re-recorded, due to them being unable to obtain the rights of the original recording. I also recently picked up a ? and the myserians album really cheap, only to find out that was also the whole album re-recorded, also due to recording rights issues. This has me curious what the real story is on the Vanilla Fudge re-recording, but I have vinyl and CD of all 5 60s albums, and the CDs, and I can vouch for them all matching. Although the CDs did come out long after '86, so I suppose it is possible there was re-recording done, and then the tapes showed up. But now I think I've steered this way off topic, so I'll stop now. After reading the posts regarding the great Percy Faith and Johnny Mathis, a question comes to mind that you may have answered already. If that is the case, please forgive my lack of memory. My question is this, with all the excellent technology that we have available today, why would a record company go through the trouble of having an artist come back to the studio to re-record a track or an entire album in which the master was damaged when they could grab a copy of the album and re-record that and run it through the re-digitalizing process? Maybe, I don't entirely understand how the re-mastering and re-digitalizing process works, but that would seem like a more simple solution. What do you think? I'm sure if it were that simple, they would do just that. But there must be a reason why that's not a viable solution, and I don't have the expertise in that area to say as to why. You're right, it's too easy of an answer. There must be some reason why that approach is not used. Thanks for the follow up! For those of us who listen to live365, there's a great channel called "Christmas & Then Some", playing traditional holiday music and featuring among others, the Christmas classics of Percy Faith. They just played Percy Faith's rendition of "The First Noel". I remember having that on a Columbia 45 Extended Play. It was likely a shortened version of an LP, probably released in the mid-1950s. Don't recall the exact title of the album. It may have been "Music of Christmas" as there were several volumes released over the years. The cover showed Santa cradling a sleeping little girl. She'd likely be an AARP member by now! Percy Faith's music was often heard on "The Yule Log" broadcasts and was a staple of WPAT's "Spirit of Christmas". In fact, I'm listening to "Christmas & Then Some" as I'm typing this and they're playing another Percy Faith selection, "Lo, How A Rose 'Er Blooming/O Little Town of Bethlehem". What you described was the original picture on the cover of "Music of Christmas." The picture was an artist's rendering of a father dressed as Santa holding his sleeping daughter. Columbia Records issued the LP with this poignant cover from 1954-1958. In 1959, it was replaced with the current cover. As for Mr. Faith's Christmas music, saying as you did that "it was often heard on the Yule Log," is an understatement. He practically was the Yule Log. The soundtrack pretty much revolved around him. I talked about this in my second post on this thread dated 10/12/08 @ 04:46:34 A.M. He was indisputably, the King of the Yule Log. As for Mr. Faith's Christmas music, saying as you did that "it was often heard on the Yule Log," is an understatement. He practically was the Yule Log. The soundtrack pretty much revolved around him. I talked about this in my second post on this thread dated 11/12/08 @ 04:46:34 A.M. I agree with you. Sorry I didn't read your earlier post. Percy Faith was not only King of the Yule Log, he was also king of WPAT-FM's Spirit of Christmas. Hardly an hour went by without hearing Mr. Faith. I fondly remember that poignant cover of "Music of Christmas". My mom had the 45 EP. Every year when I'd take it out to play it for the first time, the anticipation of Christmas grew within me. I probably thought it really was Santa on the cover! Percy Faith will always be remebered for his Christmas music, but he also had the #1 record for the year 1960, "Theme from 'A Summer Place'". Yes, he was indeed the King of WPAT's Christmas playlist as well. As for "Theme From A Summer Place," I talked about this in my third post on this thread dated 10/12/08 @ 22:30:10. I ordered my CD copy of "Music of Christmas" today from tower.com. I didn't realize how much I missed having this Christmas masterpiece in my collection until I came upon this thread. Remember I never had the full album, only the 45 EP. That probably got lost many family moves ago! It'll be great to hear it in my home again! Percy Faith's "Music of Christmas" and "Hallelujah" (aka "Music of Christmas, Vol. 2") should be an absolute part of every classic Christmas music lover's collection. I only wish you could also still purchase his second Christmas album. It was remastered and released on CD by Sony Music in 1997, but was only in print for two years. Copies now go for big bucks on eBay and Amazon. My CD of Percy Faith's "Music of Christmas" arrived today! It was great hearing it again. I was having memories not only of hearing the selections on WPAT, but also of hearing the original 45 EP in the basement apartment in Brooklyn we lived in when I was a youngster. Thanks again for this thread, and thank you tower.com for being so prompt! I'm glad you have your copy of "Music of Christmas". It is arguably the best classic Christmas album ever. I wholeheartedly agree with Chip that "Music of Christmas" and "Hallelujah" are an essential part of every classic Christmas music lover's collection. No collection would be considered complete without it. Joe, that copy of "Music of Christmas" is one of the best gifts I ever gave myself! As we get older, these simple things mean a lot! You might recall I mentioned that my mother had the Columbia 45 EP version, which had only four of the 12 selections. That was the original mono release from 1954. The version that I just got is the re-recorded stereo release from 1959. This was probably the one that got so much airplay on WPAT in the 1970s and 80s. Now I have my own copy at long last! It's never too late for anything! You're right - these simple, little things mean a lot more to us as we get older. I guess we appreciate it more as time goes on. I'm sure you'll keep the 45 EP your mother had safe and sound now that you have the CD. With the CD, you now have the whole album at your fingertips. It's good to treat ourselves to something every so often. I'm very happy for you! Right now, while I'm typing this the "Showcase" channel on Music Choice which is featuring Traditional Christmas Music is playing Percy Faith's majestic rendition of "O Come All Ye Faithful", which is also attached at the start of this thread. Without a doubt, THE best instrumental rendition of this carol ever! Ah yes! The old WPAT! A wonderful 'light music' station that many of grew up hearing here in the New Jersey area. Many a Christmas was spent being driven from one set of grandparents to another in my parents' car with the radio tuned to WPAT. It's where I first heard The Hollyridge Strings and Percy Faith. Here is another page with some 'air checks' from the 60's and other years. Percy Faith always gets 'air time' at Christmas in this house. In 1985 I bought the Christmas Memories cd. Great nostalgic cover on that one! Last year I finally grabbed the Christmas Is.. cd even though almost all of the music was already on Christmas Memories. This year I was also happy to add a legit copy of The Hollyridge Strings Christmas Favorites cd to the stack. For the past few years I had been using a 'needle drop' of both the mono and stereo copies. They don't make music like that anymore! There was nothing like the old WPAT at Christmas! For eleven months of the year, I'd listen to WMCA, WABC, 99X but when the holidays came, they were on hold until Dec 26. WPAT was the soundtrack for many a Christmas Eve gathering when I lived in Brooklyn and on Long Island. I'm now in NJ. Today is Dec 26 and I'm listening to Percy Faith's "Music of Christmas" CD as I'm posting this. Just had to hear it one more time this season! My mom had the original 1954 recording on a 45 EP. It took me until this year to get the complete album. I just came back from my relatives home and I brought along the Percy Faith CD. They remembered it quite well. Once again, Percy Faith provided the music for a Christmas Eve fish fry! BTW, were you able to find any airchecks from WPAT's Spirit of Christmas broadcasts? I agree! They don't make music like that anymore! Hope you had a Merry Christmas! Have a happy and healthy 2009! Nope. Sadly, now they only exits in my memory. Genoman, that's where WPAT exists for me as well. At least Traditional Christmas Music has been making a comeback recently on both satellite radio and the internet. WPAT may be gone forever but the timeless Christmas music they played will live on. There is also the 'ambiance' that WPAT gave that is gone. Such a great station. Great for listening to when you needed 'quiet time'. 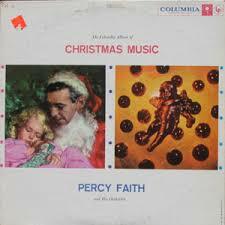 ANyone heard this import CD of Percy Faith CHristmas Music? Does it sound any better than what is currently available? I've previously talked about this import CD on the thread Percy Faith Album Question. Click here and scroll down to my post dated 09/06/2009. This import CD is a release of the original 1954 Mono recording of Percy Faith's Music Of Christmas.